In the past, Facebook has been timid about instituting new ad formats, especially anything that inappropriately disrupted the flow of user-generated content in a News Feed. But the world’s most popular social network recently opened the floodgates for businesses by beta testing Facebook Offers, a new ad format tailored for merchants and small enterprises. When it finally comes online, this ad tool will enable your Facebook fans the opportunity to obtain discounts and offers from your business by clicking a “Get Offer” button appearing below special posts you send to their News Feed. Users can then print and redeem your Offer at point-of-purchase, or show the Offer at your place of business using their mobile phone. Unlike Facebook Check-In Deals, Facebook Offers doesn’t require users to check-in to a merchant’s physical location in order to take advantage of an offer. That’s likely to make Offers appealing to consumers who are wary of their Facebook Friends knowing where they are and what they’re buying. 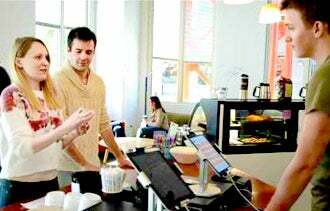 In another pro-business move, Zuckerberg and Co. has snatched up both the team and the assets of mobile-based Tagtile, a Bay Area startup that helps local merchants offer and track mobile-initiated loyalty programs. Consumers who download the free Tagtile app (available for iPhone and Android users), redeem discount offers and earn “tags” when tapping their phone against the Tagtile Cube (a sleek point-of-purchase display that verifies and completes the offer). Helping local businesses with a presence on Facebook identify, engage and increase repeat purchases from customers through a frictionless loyalty and direct marketing solution that integrates with Offers would be a genius move. I expect the physical cube to be shuttled aside once near field communication (NFC), which establishes radio communication between smartphones, becomes more accessible. In the meantime, it’s fairly easy to imagine the attention that a Facebook-branded cube would attract at point of purchase. Are you likely to take advantage of the Offers ad format for your business? Let us know in the comments below.